The latest Hulk rumor is that the coaster will ditch its MCBR like Ghostrider at Knotts. This is because there are not breaks, catwalks, or stairs on the MCBR track. Hulk could regain its capacity by adding a duel station since the coaster stacks anyway. I think if Hulk did get a duel station, it would be like Dragon Challenge. A Load and an Unload. What do you think. Will Hulk be the same or have a duel station? The reason GhostRider is losing the midcourse brakes is because they don't make sense for the ride. When GhostRider opened, the coaster operated with all three trains. After a couple years, however, the park decided that only two trains were to be operated on the ride because the capacity increase when using the third train (~20%) did not justify the increased maintenance costs on the ride (~30%). With only two trains, the midcourse was not necessary, but it was used as a trim beginning in the late 2000s/early 2010s (I forget exactly when it started) to keep the ride from tearing itself apart. Since the plan for the new GhostRider is to only run two trains, a midcourse block is not needed, and since the new trains are lighter and running on properly maintained track, trimming is unnecessary. Knott's is purchasing three trains for the ride, but only so that they can run two trains year-round even while one is getting required maintenance. In the case of Incredible Hulk, the ride is designed to operate three trains and (assuming the same holds true as with the original version of the ride), USF will have four trains in order to always have three available to run. While I have not been on Incredible Hulk, I have plenty of experience with other B&M coasters, and while most could run three trains without a midcourse the benefit of the third train would be negligible in this situation. If there is no midcourse block, operators would need to wait until a train completes the course before dispatching the next one, increasing the dispatch interval and decreasing capacity. In addition, B&M tends to install more block sections than necessary on their coasters in order to precisely control train speed and maximize efficiency. Just because no brakes have been installed yet doesn't mean there won't be any...one of Hulk's final brake sections was installed without brakes as well, and it wouldn't make sense for B&M to use that spine style if they didn't need space to accommodate equipment. As for a dual station, this is typically used where the anticipated loading time is significantly greater than the target dispatch interval, such as on flying coasters or rides running many trains. While it's possible that the ride could receive one, if there has been no building modification it is doubtful and generally a three train sitdown coaster wouldn't benefit from a dual station. Just to back all this up, here is a comparison using the three train B&M coasters operating at SFMM, namely Riddler's Revenge, Scream, and Tatsu. Now, none of these rides operate three trains anymore because the park has decided the costs outweigh the benefits, but all used to do so. While slightly longer and having a lift hill, Riddler's Revenge and Scream are both similar to Incredible Hulk: one station, midcourse brakes, and two hold positions at the end. With three trains, both of these coasters get around 20% more capacity than they do with two trains. Meanwhile, Tatsu uses a dual station and does not have a midcourse brake, and it gets within 5% of the same capacity value regardless of whether two trains or three are being used. The main benefit to the dual station is that Tatsu can get about the same capacity with two trains that a typical coaster would get with three since there is no delay between trains. However, due to the design of Tatsu it takes longer to unload and load a train than it takes for a train to complete the course, so a midcourse brake wouldn't allow for faster dispatches. If Hulk can load in a typical time for a sitdown coaster, the train will be ready well before the one in front would complete the course, making the lack of a midcourse brake highly inefficient for three train operation. Is Scream hard to get to at SFMM because Bizzaro at Great Adventure is really far back in the woods and it always runs three and double stacks. As with Tatsu I know the way they load Superman at Great Adventure is just as or more efficient with the single station and two trains as Superman at SFOG and Tatsu with duel stations and three trains. Hulk sometimes double stacks too but I wasn't saying that they will only use the miscourse as a trim. I was just addressing the rumors. I thought roller coasters are separated by segment sensors so no midcourse brakes are needed. Since most rides are 90 to 120 seconds, a 1 minute separation is plenty to have two trains on the tracks and one train at the station. The returning train entering the station usually waits an extra minute for the train to dispatch. Ghostrider is a longer ride at 2 minutes 30 seconds. The trains will stop at an emergency anyways. Logically, I don't see how a midcourse brakes avoid collisions. A train coming at full speed from the top will no more likely hit a car near the bottom at the same speed. Slowing the train speed only affects the train at the station to give them more time to dispatch, but the train will be stopped there anyways. If anything, they should lengthen the tracks at the end if it is likely the trains will backup. Jaiden, Scream is much more conveniently located at SFMM. It's still in a dead end, but it is just down the walkway from Twisted Colossus. I have seen the operations at Bizarro, and while I know floorless coasters take longer to load and unload I've come to the conclusion that the ops on that particular ride just aren't very good. At SFMM, Scream typically runs two trains with no stacking, and while stacking is going to happen anyway with three train operation there is no reason to double stack the trains. While I don't know the numbers, I wouldn't be surprised if SFGAdv gets more capacity on their Superman than SFOG. I'm curious...where did you originally hear this rumor? I'm not accusing you or anything, I just haven't seen it on any of the sites I frequent and was wondering where it came from. Anon, there are sensors at the beginning and end of each block section, but every single roller coaster requires a brake section of some sort between two trains at all times. In the event that a train doesn't complete the course, there needs to be a mechanism to stop the following train before a collision occurs. If there are no brakes, there is nothing to stop the train. To maximize efficiency, it is usually best to space block sections out evenly throughout the ride, thus coasters with three or more trains usually have a midcourse brake (or possibly multiple midcourse brakes if many trains are used). Based on your information and the construction that has happened so far, it definitely seems like any changes to the new attraction will be minimal. 90 seconds was probably the time from launch to brakes, but if there is an additional show scene that would make the ride feel longer. The difficulty is that LSMs cannot launch from a standstill on an incline, so we'll have to wait and see what happens. I doubt the ride will actually be faster, but a faster launch is definitely possible. Jaiden, I'll have to give that a listen. I know of In the Loop, but rarely actually listen to their podcasts due to time constraints. I'm still skeptical that the midcourse will be removed as even with a dual station capacity would drop at least a few hundred riders per hour (possibly even more...my rough estimate would be about 1,300-1,400 riders per hour with no midcourse), but perhaps they've got a different take on it. Yeah, basically all insiders are saying there are no substantial layout changes. I can only think of a show scene somewhere to make it longer, just a guess of course, but coupled with new on board audio and maybe new cars, that could make sense.But a couple of OU insiders are doubting the longer ride. The queue will definitely change according to all reports I've seen, so that should be interesting. All the footers stayed in the same spots (even though they reworked them), so that would again probably indicate the layout stays the same. With the same track length, the only way to add that much time would be a tunnel scene at the end/or beginning. Concerning Hulk's time prior to the dismantling, Seth Kubersky of Touring Plans, in his Universal book clocks the Hulk in at 1.5 minutes. Seth usually run a stop watch on ride length for his books. So that may be the launch to end as you speculated. The mid-course breakrun is probably staying but hasn't had the equipment installed yet. As for the ride being longer, I could see Universal adding something to the end of Hulk similar to the ending they have for Universal Hollywood's Revenge of the Mummy. If you all are not familiar with this, unlike Orlando's version, Hollywood's version starts off with a forward launch and goes through about half the ride before stopping at the beatle scene. From there, the ride continues through the second half backwards ultimately coming to the breakrun. Instead of having another launch to make the ride go forward again, the train enters a domed room backwards and the ride vehicle is then turned around to face forward. While I don't think the Hulk will do a turnaround scene at the end of the ride, we could possibly scene and ending scene after the break run. The train could hit the breakrun and go straight into an attached part of the station where a final show scene could take place. The end of the scene could end with a fog effect of sorts and a screen would lift up giving a way for the train to enter the station. Just a thought. 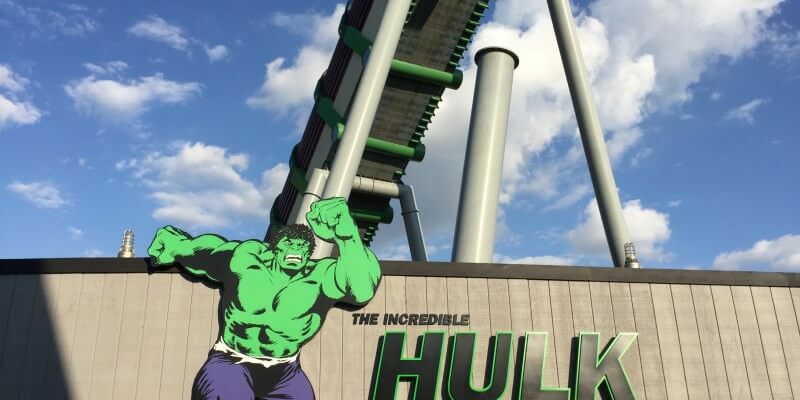 Also as for the ride having a duel station, I don't think that we are going to see a station like a B&M flying coaster, but I could see Hulk having a duel unload and load station. This would prove to be effective. However, as others have said, Hulk doesn't run 4 trains at one time. One of the trains is always in the maintenence bay. If you have one train going through the ride, one train in the station and one train just reaching the final breakrun, there really is no point for a duel station.